Memories of life in and around Mitcham’s Church Road where the author’s parents ran a newspaper shop. one and was told to ‘keep mum’ where it came from. This was the first watch I ever owned. recovered from the local incinerator before they were burnt. told him not to cry in front of the women and children or he would chuck him outside! the countryside was the worst time of my life. people used to rush out to collect the manure for their gardens after the horse had passed. of any sort, or Arabs. If you were to leave London you felt as if you were entering a vast emptiness. we knew black people lived was in Brixton (this is not racism but history). and cars, Britain has lost much of this spirit. because of the rubber factories nearby, which added their own aroma. Children used to follow behind the tar lorry being told the smell was good for their health. ‘Bunces Meadow’ was a nice quiet field off of Phipps Bridge Road and led over to Hatfeild’s Park. I used to take my canoe there when I was about 17 and paddled up and down its quiet, clean river. in the railway yards at Christchurch Bridge. in South London. Frequently, I had a paper round before school and another when I got home. and letting the mayhem take place. me or I couldn’t go. Barrow Hepburn and Gale Ltd., – manufacturers of conveyor and transmission belting. to begging, which it probably was. never had long trousers until they were about 14 years old. the war was over and that we would not be bombed any more. was a well-established method of settling grievances. to fight. I believe one captured lad was tied to the railway lines. he had to run behind while they rode his bike, pulling him along. fleas and all floor boards had to be lifted and sprayed. quickly became terrified of him. horizontally out of bottles and bangers stuck through letterboxes for amusement. over, so another avenue to the countryside was lost to children to play in! plates in a book, but this craze died out when the car boom ruined the hobby. and Snowy. People listened intently using their imaginations to fill out and enhance the programmes. 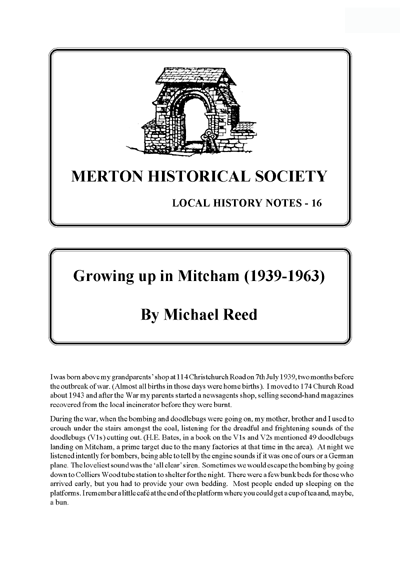 This entry was posted in Publications, Local History Notes and tagged in mitcham, modern mitcham, Reminiscences.